Vincent Plush ties a bow on this year's Canberra International Music Festival, rounding up the last day and Festival Finale. If there was a curtain at the Fitters’ Workshop, that curtain has now come down on the 24th Canberra International Music Festival with another day of discoveries, re-acquaintances and cheerful encounters. During the past ten days, the CIMF has presented over two dozen events, often three per day. It has programmed around 100 pieces of music, performed by over 100 musicians from throughout Australia and the world beyond. 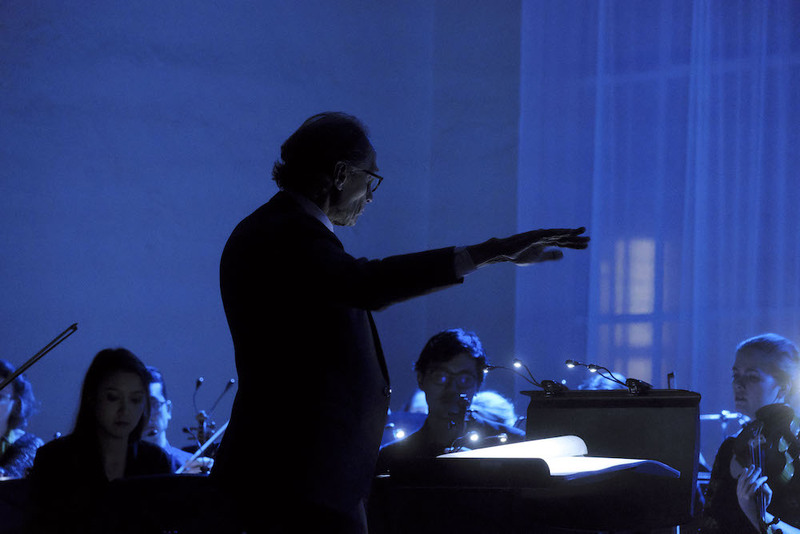 In the main, it has been another very stimulating program, the fourth devised by conductor/pianist Roland Peelman as Artistic Director, whose concealed connections and origins only slowly revealed themselves through his festival. This reviewer has managed to attend around 18 of the major events, and has managed to experience music that extends back 500 years to new works, barely a month old. In total, it has been an exhilarating and sometime exhausting ride through music history. As another brisk autumn day opened around the Kingston Foreshore and its bustling markets, the Fitters’ Workshop opened its doors to another busy day. It began with a program designed specifically for young families, opening with the premiere of a new work by a rapidly emerging young composer from Western Sydney. Holly Harrison’s new piece The Mad Hatter’s Tea Party poured another cup from the bottomless teapot of Lewis Carroll. After a brief respite from Boccherini (the famous Minuet from the String Quintet in E), narrator Paul English and the Festival Sinfonia directed by the enterprising young Canberra conductor Leonard Weiss launched into a performance of Prokofiev’s Peter and the Wolf. The afternoon concert, with its portentous title of The Art of Speech, moved to the Fairfax Theatre of the National Gallery of Australia. Austere and unadorned, it is the near-perfect venue for lectures and film screenings. Indeed, it was very appropriate for the austere music of Erik Satie whose music comprised almost the entire hour-long program. Unfortunately, as a concert venue, it is quite inappropriate; its dry, hollow acoustic neutralizes any attempt at expression. Satie’s monodrama Socrate (1917/18) is a 30-minute-long setting of three texts by Plato. In this rare performance, it was delivered by mezzo-soprano Kate Howden in a bland, neutral, expressionless tone, redolent of the frozen Greek statuary of a museum. Her vocal delivery did not entirely capture the nuances of the French text, and the projection of the translation did much to enhance the enthralling drama of the work. The accompaniment of international visitor Keiko Shichijo, whose revelationary playing of Schubert and Beethoven earlier in the week was a highlight of previous concerts, was a near-perfect match for the expressionless delivery of the text. Less successful, though, was her mannered performances of three short Gnossiennes, played through the Impressionist gauze of Debussy. The true revelation of this concert, though, were the Six Dances (1906), a set of short piano pieces by the Armenian composer Komitas Vardapet (1860 – 1935), a composer unknown to virtually everyone at this festival. Like the music of the prolific American-Armenian composer Alan Hovhaness (1911 – 2000), this is music anchored in traditional Armenian dance styles and ancient liturgical monadic chant, pre-dating the Christian era. Shichijo’s performance of the dances were somewhat restrained and respectful. Even so, the music represented yet another vivid ‘discovery’ to emerge from Peelman’s panoramic research for his CIMF programs. 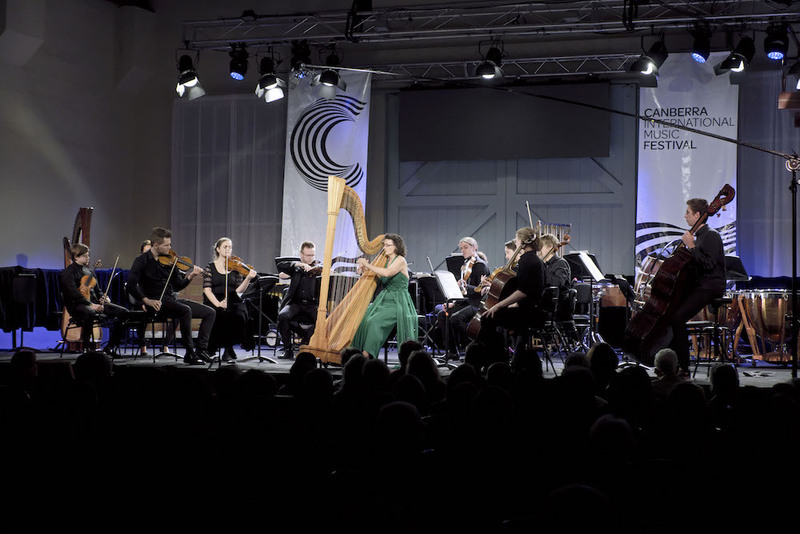 This concert was billed as Barbara Blackman’s Festival Blessing, a now annual event acknowledging the $1 million gift to music in Canberra several years ago by the revered Canberra-based philanthropist and music-lover. Nearing the age of 90, the blind poet is recuperating in hospital after a recent fall and was unable to attend the concert or participate in the advertised conversation with Andrew Ford. In her stead, the CIMF’s composer-in-residence Mary Finsterer engaged her peerless interviewer and the audience in an illuminating discussion about her own compositional aesthetic, particularly in relation to the work which featured in the ensuing concert. Several of the things explored in the afternoon concert – Ancient Greek tales and dances, Socrates and blindness – percolated into the Festival Finale back in the Fitters’ Workshop that evening. 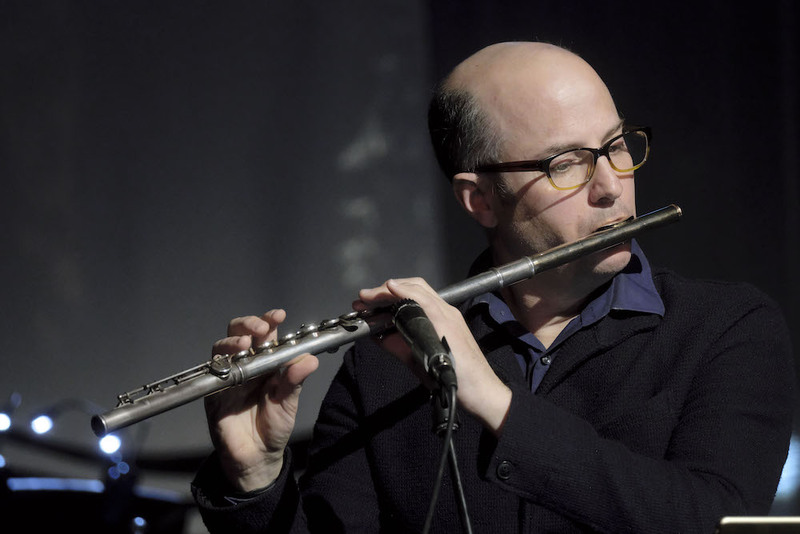 Multi-talented flute-player and composer Ned McGowan opened the evening, not with his signature instrument, the contrabass flute, but with a brief solo flute piece by the influential contemporary Italian composer Salvatore Sciarrino. There were further resonances of Ancient Greek culture in the work which opened the second half of this concert. For the near-capacity audience, Debussy’s Danses sacrée et profane provided welcome fare. It was performed by the conductor-less strings of the Festival Sinfonia (seven violins and pairs of violas and cellos and a single contrabass, including the two young string quartets) led by Peter Clark. Alice Giles, radiant as ever in an emerald green gown, was the harp soloist. Audience members near the present reviewer heard him exclaim “Wow!” at her very first note. Giles gave a strong, masterful, no-feathery-nonsense performance of this familiar gem. Over the years, she has created a school of harp-playing, reflected in the splendid harp septet SHE heard in earlier concerts, unrivalled in this country. She has been a great boon to Canberra and inexplicable loss to the controversial restructuring of the ANU School of Music. At 30-minutes, Finsterer’s work is a tour de force of orchestration, concentration and endurance for players and audience. Its musical language is couched in the lingua franca of late 20th-century European composers like Berio, Ligeti and Scelsi, a language unfamiliar to most of the audience, especially those who did not hear Finsterer’s remarks earlier in the day. Many confessed they simply did not know how to listen to music like this. All hail to Peelman for including such ‘difficult’ works in his programs – even in the traditionally celebratory nature of the festival’s Finale – but if the composer of a major work such as this is physically present, she or he should be afforded a few minutes on-stage before the performance to provide a few sign-posts for the experience ahead. Opening in almost complete darkness, elongated pitches emerged reluctantly from virtual silence, against a shimmer of sounds from harp and celesta, like the wonders of a children’s toy-box. Gradually, a counterpoint of different elements took shape, never quite fully formed, always blurred, somewhat elusive. Suddenly, around ten minutes in, there was a fortissimo outburst on the tubular bells accompanied by flashes of gold light on the hall’s ceiling. Startling the audience on each appearance, this coup de théâtre signified ‘gold,’ the only colour the blind Borges could see. Unaware of the sonic-visual correlation, some in the audience assumed that “there was something wrong with the lights”, an observation that distracted from their overall appreciation of the piece. Finsterer’s evocative score summoned up memories and echoes of early music (Berio) and clusters of intensity (Ligeti), envelope shapes (computer music) and a repeated shudder on lower strings (perhaps recalling the music of her main European teacher, the Dutch composer Louis Andriessen). Even lacking comprehension, the audience listened with rapt attention throughout. “I don’t know why,” one woman confessed to me at intermission, “but I sensed we were in the presence of something new and wonderful.” And, indeed, we were. Earlier in the week, we heard works which illustrate Finsterer’s growing pre-occupation with Renaissance music. It will be wonderful to see where this path takes her in a new orchestral journey. In a tribute to the centenary year of Leonard Bernstein (1918 – 1990), the Finale closed with one of his lesser-known concert pieces. Serenade (after Plato’s Symposium) is, in effect, a 30-minute concerto in all but name, for solo violin and accompaniment of harp, percussion and strings. Again, it returned us to Ancient Greece and, in the final movement, to Socrates himself, in a discussion of love at a notional dinner hosted by Plato. Written as a concert piece for Isaac Stern, and first performed in that city of amorous serenades, Venice, in September 1954, it reveals glimpses of the opera Candide, which Bernstein was composing at the same time, and buckets of Stravinsky, especially the neo-Baroque pieces and L’histoire du soldat. Two evenings earlier, we had cheered the develish violin playing of Tim Fain, the current wunderplayer of New York new music. Now, here he was tossing off the roulades and ruminations of Isaac Stern and Bernstein with gay abandon. 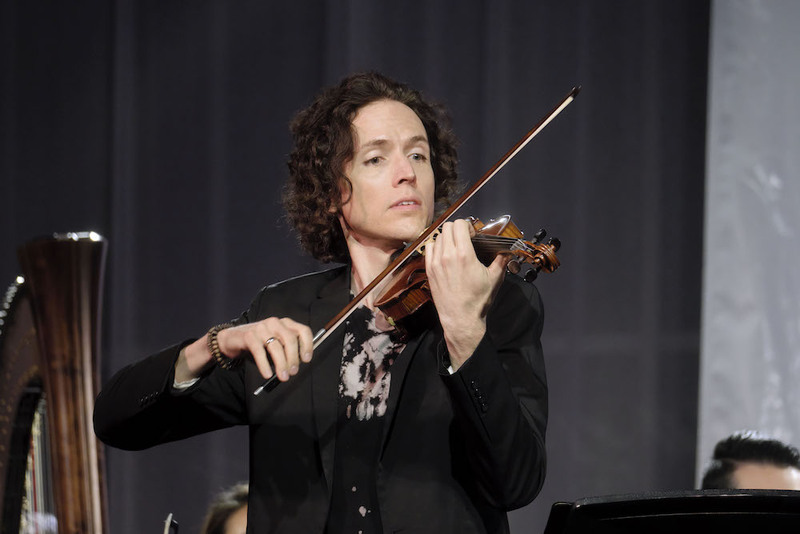 Fain has a crystal-clear tone and effortless bowing arm, and an immediately engaging presence which suggests he should be engaged by the major orchestras here to perform his signature pieces, including the Philip Glass Violin Concerto. With precious little rehearsal, there were moments of indecision over intonation in the lower strings, but such quibbles were quickly dispelled by the sheer flair, élan and joie of the performances. Like any number of festival ensembles, especially those in North America, there are many under-rehearsed ‘seat-of-the-pants’ performances; here, Peelman’s assiduous attention to every gesture and nuance ensured that each performance was more than creditable, often they were extraordinary. And so, with all the raffle prizes assigned and the bunting taken down, the Canberra International Music Festival prepares for its 25th anniversary season in 2019. CIMF Board Chairman Beverley Clark has announced a $25,000 fund to re-inforce Peelman’s meagre program budget. The ACT government should be applauded for saving the Fitters’ Workshop for music. Now, it should consider the goldmine it has in an annual festival which attracts 15% of its audience from outside the ACT. The impact for cultural tourism dollars is obvious. If the festival is to continue to expand, the facilities at the Fitters’ Workshop need to be addressed immediately. Millions are being expended re-fitting football stadiums and the like; surely the ACT government could find a cool half-million to re-furbish the facilities around the Fitters’ Workshop? Already, the Canberra International Music Festival has moved up to the ranks of more established festivals in Townsville, at Huntington and the wine centres of Victoria, South Australia and West Australia. Now with national and even international notice, it deserves a home befitting its status and accomplishments. The Brodsky Quartet and Quatuor Voce among the guests in Roland Peelman’s Bach-infused 2019 festival. Benjamin Bagby brings Beowulf to life in an epic retelling. The Oravas live up to the hype and more in this stunning concert of Haydn, Rachmaninov and Debussy. Susanna Borsch's white-hot performance was made for the Glassworks Hot Shop. A treat that will live long in Canberra’s memory. This year’s CIMF continues to build on its previous strengths and uniquely positioned character, writes our reviewer from Canberra. CIMF Artistic Director Roland Peelman speaks to the former-nun-turned-composer about her upcoming string quartet. We spoke to the Canberra International Music Festival's Artistic Director about his plans for this year's festival. Benjamin Bagby’s Beowulf and Handel’s Israel in Egypt among the highlights of the festival, which is united by the theme of ‘Return’.